Different things cause carpet stains. Some can be removed easily and fast, while others can be very stubborn. In some cases, a simple soap and water cleaning solution is enough to get rid of them, while others may need serious, deep-cleaning from professional carpet cleaning companies. 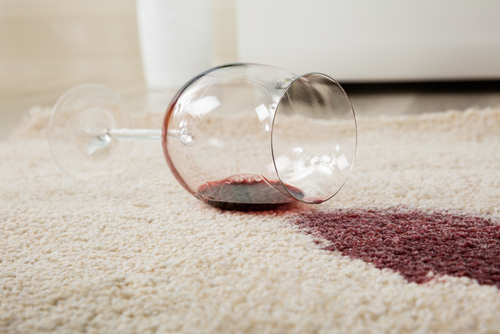 If you are faced with a carpet stain problem, it is advised that you try to remove it yourself first. That way, you could save money, if it works, and expand your DIY knowledge with a new carpet spot & stain removal DIY technique. 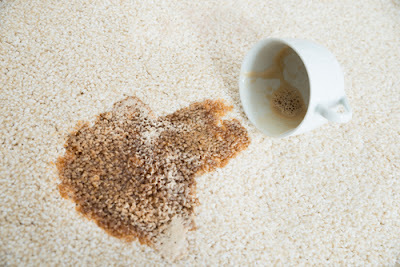 While there are numerous carpet stain removal products in stores, there are also several home remedies for carpet stain removal that you can learn so as to be ready when an accident to your carpet happens. Old carpet stain removal can be quite a challenge, so it is important that you act on any type of stain as soon as possible because it is easier to get rid of them when they are still fresh. Below are some of the most common carpet stains and examples of carpet stain removal DIY methods to get rid of them. Using a clean, dry cloth, dab the spillage on the carpet to absorb as much of the moisture as possible. If it has dried, pour a small amount of water to lift the stain, and then dab it with a cloth. Prepare a stain removal solution by mixing one cup of water and a teaspoon of liquid detergent soap. Soak a clean, dry cloth in it and repeatedly dab onto the carpet stain. Do this again and again until the stain is lifted. Rinse the area with clean water and let it dry. Blot the stain with a paper towel. Prepare the cleaning solution by mixing a cup of water and half a cup of white vinegar. Pour some of the cleaning solutions onto the coffee stain to lift it. If the stain remains, prepare another solution by mixing a cup of water and a teaspoon of liquid dishwashing soap. Pour this onto the stained area to lift the stain. Take a clean, dry cloth and blot it onto the stain. Repeat all procedures until the stain is gone completely. Rinse with water. Use a clean, dry cloth to blot the stain and soak up as much of the moisture as possible. Prepare an ammonia solution that is made up of a cup of water and two tablespoons of ammonia. Pour this into a spray bottle and spray onto the blood stain. Dab the treated area with a paper towel to get rid of excess moisture. Prepare a simple soap and cold water mixture and pour that onto the stain. Blot with a paper towel. For homeowners who don't avail of the services of residential cleaning specialists, it is important to consider engaging the services of a professional organizer or maid service provider at least once a year. You have to strictly observe this home cleaning essential if you want to whip your home back into great shape. For instance, you may find that your carpet may not require the same level of care and maintenance compared to the other parts of your home. Nonetheless, you have to strictly observe a yearly carpet cleaning regardless of the condition of your floor rugs. This home cleaning task is primarily done to extend the service life of the floor carpet and to ensure that highest air quality is maintained. This is important if you are concerned with the reduction of common illnesses and allergies that are usually associated with poorly maintained carpets. Whenever it is possible, you must seek the service of professional carpet cleaners. However, if you are looking for cost-saving options, you may adopt a combination of professional and DIY carpet cleaning options which you will alternate on a year-to-year basis. That being said, there are many caveats that you must take into account if you are going to adopt DIY carpet cleaning. Inexperienced homeowners tend to apply a higher amount of carpet shampoo than what is required hoping that this will give them better results. This is a perfect example where using more does not necessarily mean getting better results. If you use more than the specified amount of carpet shampoo when doing the wet type of DIY cleaning job, no amount of rinsing can completely remove the soapy sediments. If this happens, you will end up with a carpet that is prone to accumulate more dirt and debris. If there is one thing, that novice DIY carpet cleaners must avoid it is using a carpet cleaning solution without testing it on a small and inconspicuous portion of your rug. It is important that you use a cleaning solution that will not damage your carpet. The wool fiber material of your carpet has a built-in protective layer that helps remove dirt and moisture from the outer surface of the carpet pile material. This means that simple vacuuming is enough to remove dirt and debris. Although the use of stain repellant can enhance the moisture resistance of your carpet, it can also attract and hold dirt and debris. This condition will ultimately lead to premature soiling of your carpet. 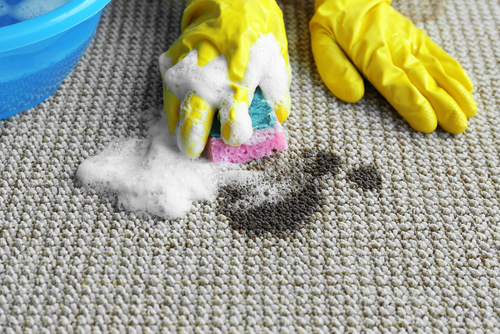 Over-wetting happens when excessive water is used in cleaning the carpet. This results to the soaking of the bottom part of the rug. Exposure to the moisture of the backing material can lead to discoloration of the carpet. In some instances, this condition can also result in shrinkage, and you will end up with torn portions of your carpet. Another serious concern when you commit this mistake is the emergence of mildew and mold problems.